I laid nervously on the operating table unable to see what the obstetrician was doing beyond the white sheet draped across my chest to block the view. I was waiting for the surprise of my life – what would the gender of my long-awaited first born child be? This baby, after 4 miscarriages, would finally make my dream of being a mother come true. My heart lept! The tears streamed down my face. A boy. I had already chosen his name. He would be called Brendan Bjorn. Seven pounds, eleven ounces and he was proclaimed perfectly healthy. I was finally a mother, thanks to this amazing little baby boy who I now held in my arms. Thirteen years ago today, I couldn’t have imagined the journey that very baby would soon take me on, as within weeks, his condition and the resulting severe brain damage would cruelly reveal itself. For so many years, after so many losses, I never thought I would be able to be a mother. For so many years, after so many near misses, I never thought my precious son would live to be a teenager. But here we are today, 1 October 2017, celebrating this most special, incredibly momentous, thirteenth birthday. We won’t have a party. I’ve tried that in the past and had no one show up. (I know that some of my fellow special needs parents are nodding their heads in recognition.) We won’t have a bouncy castle in the garden. No trip to the cinema with friends. And sadly, not even one birthday card came in the post this year. I’m still holding out hope the few that should come are merely late, although I have a feeling that if they were to come, they would have been here already. So be it. We have each other. Today, Declan and I will surround our beloved Brendan Bjorn with smiles and laughter. We will sing happy birthday to him while the candles on his birthday cake flicker in front of his beautiful face. It is a cake he cannot eat. They are candles he cannot blow out. We will make the wish for him, blow out the candles for him, and enjoy the cake on his behalf. And through it all…through it all…I will do everything I can to keep the sweetness from turning bittersweet. Thirteen years ago today, my world was turned upside down. The life I thought we would have instead turned out to be nothing even remotely close to what I had envisioned. There had been, and continues to be, struggle, anguish, heartache and pain as I attempt to not fall flat while literally and figuratively carrying this fragile child of mine on this journey. But there has also been, and continues to be, tremendous beauty, learning, the deepest of joys and the purest of loves as we navigate our way together to wherever it is this journey will lead us. 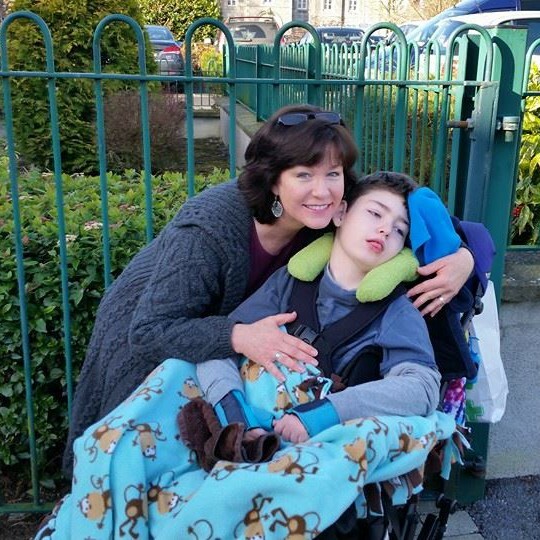 My first born son with a life-limiting condition is THIRTEEN today. What an absolutely priceless gift he has given to me. Happy Birthday to Brendan. You are amazing how you keep strong, but as you say you just have to for Brendan. Reading your posts makes me realise how much I take for granted. Life is not fair. Happy Birthday Brendan, thinking of you all today. Would have sent a card had I known. Let me know your address and I’ll pop a delayed one in the post. Happy Birthday Brendan! What a touching story, thank you for sharing. Happy Birthday, Brendan, and may all your wishes and those of your precious Mama and brother come true. From an 8 year old, across the waters, in a similar situation. I would love to be your friend, if you would like that, our mummies could sort it out by email?